Successful social change relies on the mastery of servant leadership. Servant leadership, defined as a philosophy that suggests positive ways that leaders should serve their community, prioritizes the voices of The People over one’s own self interests. This lens of leadership focuses on an equal distribution of power in an effort to understand that each person plays a pivotal role in the transmission of knowledge, the communication of needs, and the illumination of a community’s concerns. Servant leadership also mandates that leaders should use the privileges ascribed to one’s identity to position oneself as a change agent who willfully uses their platform to uplift the voices of the people they serve—rather than speaking over them. 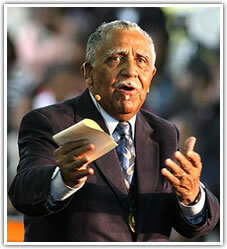 For example, the way that Joseph Lowery used his platform as a minister during the Civil and Human Rights era allowed him to fully engage with the community to enact social change. Affirming the priority of highlighting the concerns of the community begins with actively engaging with members of a community in spaces that they have already begun to organize for social change. By engaging with communities in this way, servant leaders develop a better understanding of how their positionality can be used to serve thoroughly. For example, spaces like neighborhood association meetings where residents of an area routinely commune to share sentiments regarding their opinions of how outside entities (like government legislation and the police force) affect their livelihood prove to be hotspots of knowledge that traditional leaders often refrain from exploring. Traditional leadership roots itself in an ideology that assumes that the community members merely serve as empty vessels waiting to be filled by benevolent leaders who possess the power of knowledge and know how to serve without understanding what truly disturbs the community. This manner of thinking completely negates the community’s control in dictating where and how they prefer to delegate tasks and ask for help which undermines their own efforts to develop as change agents. Defining “change agents” as people who act as catalysts for social change reintroduces the notion that a positive execution of social progression cannot thrive without an effective implementation of servant leadership. Servant leaders are people with a clear vision who focus on building strong relationships with trust as the foundation through patience and persistent engagement. Servant leaders should be diligent about fostering positive connections and facilitating fluid communication in environments where people are affected by separation. This begins with ensuring that each person involved in the facilitation of societal evolution recognizes one another as valuable contributors. THE AG IS CORRECT. OUR RICH AND VIP SERVANT OF THE PEOPLE OF THE ZAMBIAN ENTERPRISE IS NOT A PUBLIC OFFICER PRELIMINARY ARGUMENTS. ======================== If he is not a Public Officer, what is he? Ma legal definitions nayo sivintu! Okay let”s just say that we have different definitions of this compound word. One thing for sure is that the president is our “rich SERVANT. Definition of civil servant: a person employed in the service of a government. synonyms: public servant, government official, government worker, civil-service employee; bureaucrat, mandarin, official, administrator, office-holder, functionary; jack-in-office. Iwe AG LK landa bwino. Are you using the legal confuse them dictionary or what?